Obkio's Blog | Obkio 1st anniversary! A year ago, I decided to start Obkio with a clear objective in mind: build a simple distributed performance monitoring solution for IT pros. All the systems / network / IT administrators are using monitoring solutions to get availability information on their servers or network devices. They know if the device is up or down and they have some knowledge of services running on the server (ex: number of requests per second on a Web server). But what about performance? Is the network performing well? What about my applications performance? Your users or customers are reporting slowness but where is the issue? And do you really want your users to let you know something is not performing well? Performance monitoring is more important than ever with all the IT Infrastructure and Software moving to the cloud. So on February 1st 2018, Obkio was born. At that time, I had a proof of concept and a head full of ideas! After 10 years as Co-Founder and CTO, at Fibrenoire (IP/MPLS Network Operator in Canada that is dedicated to business solutions), I decided to start with Network Performance Monitoring (NPM) before Application Performance Monitoring (APM). Since the beginning of Obkio, I am working with software developers at Caravan, a software development cooperative in Montreal. We have been working hard for months and in July 2018, we launched our very first version of the service to selected customers with a single goal in mind: to get feedback! The feedback was awesome and a month later, we have our first paying customers! 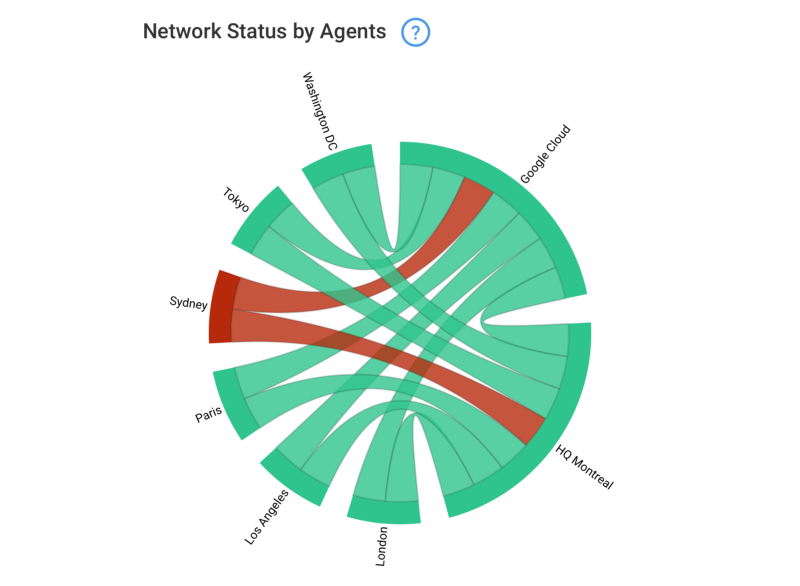 Here is an example of the App Dashboard, representing the Network Performance Status between a company’s HQ, Public Cloud and Remote Offices. With a first version, we need to develop new features to enhance the product value but we also need to show our solution to more people. That’s why Pierre-Luc joined Obkio as partner in October 2018 (find out all the details in the article Obkio New Partner – Pierre-Luc!). After hard work in October and November, we released our website and our first public version of Obkio in December 2018! Since then, it is possible for anyone to create an account and try our solution for free. And we are very proud that just a few days after that launch, we have customers that found us through social media and subscribe to our service. All we have done in this first year would not be possible without the awesome team that is working on Obkio. Thanks to Jean-Philippe, Gael, Michel, Maxime, Jonathan, Antoine and Pierre Luc for taking my crazy ideas and making it a real solution! Public Agents operated by third parties such as VoIP Service Providers are now available at Obkio. The Web App is now out of beta. Give it a try at app.obkio.com! Fault Monitoring vs Performance Monitoring - What's the difference? IT Pros are used to Fault Monitoring but what about Performance Monitoring? What's the difference?